"Journey Into Our Son's Culture"
While adopting our baby son from India, we had an opportunity to visit him — and see what his life was really like. Halfway through the process of adopting a baby from India, we went to New Delhi. Since we were traveling to India anyway, the temptation to visit our son — named Partha — was great. Despite our desire, we felt some apprehension. We had been told by our agency that our son’s orphanage was excellent, but we could not help imagining the worst. What would we do if we hated the orphanage? And then there was that comment people would surely make if they heard that we might meet our son: “I can’t believe you will go see him and then come home without him.” But, our desire to see Partha was so strong, we went ahead and made plans for the trip. We knew the orphanage was in Kanjirapally, a town not too far from Kochi, the largest city in the state of Kerala. Since we couldn’t find Kanjirapally on our map, we decided it must be a suburb of Kochi. We had a vague idea of what Kochi was like — beautiful beaches, a high literacy rate, lots of Christians and Communists, remnants of Jewish and Arab communities, a center for classical dance. The flight into Kochi was charming — the green ocean, tall palm trees, blue sky, red tiles on the airport roof. Our bags appeared in minutes, and the moment we stepped out of the airport, we saw our names on a sign held by the driver the orphanage had sent for us. We zipped away from the airport in an Indian version of a sports utility vehicle, certain that we would soon enter Kochi and then come into Kanjirapally. We never entered Kochi. We drove for 2-1/2 hours into the foothills of the Western Ghats, along progressively more winding roads. We continued to see palm trees, but now they were on hillsides amidst rubber, coffee, and tea plantations. We weren’t totally wrong in our preconceptions of Kerala — the lovely green landscape was dotted with Christian shrines and Communist flags. By the time we reached Kanjirapally, we realized that we were far from the orbit of Kochi. Our little boy was in a different world than we had imagined. After the dizzying ride, it was wonderful to walk into the cool, somewhat darkened living room of orphanage director Elizabeth Abraham. She gave us a cup of tea and we chatted. We discovered that, besides being director of the orphanage, she taught history at a nearby college and was the mother of four children. After some time, a woman entered with a baby who, after a moment, we realized was Partha. We had fallen in love with him in the photos and the videotape we had received, but here he was in real life. We were even more charmed than before. We were taken to the orphanage itself, called Sishu Kshema Bhavanwas. It was not the cold, dreary, institutional place we had dreaded, but rather a sort of holy place that had grown up in a very organic way, literally in the back yard of the director’s home. As if you were at a temple, you removed your shoes and washed your feet before entering. But in this case it was done for the practical reason that babies were on the floor. In the simple tile-roofed building, there were 20 babies, most of them under six months of age, as well as a dozen caregivers and a registered nurse. Small cribs were everywhere. The caregivers comforted, changed, fed, and teased the babies, while the nurse wrote up reports. Malayalam (the language of Kerala) songs played softly in the background. We met Valsamma, who, much to Partha’s delight, swung him up and down in a rather jerky and angular manner. We were very taken by the atmosphere. If our child had to be in an orphanage, this was the one to be in. Over the six days we were in Kanjirapally, we saw Partha in many moods — calm, ecstatic, sleepy, hungry, and wanting attention. He was attached to several of his caregivers and, perhaps consequently, was a bit uneasy with us. He responded to the rhythms of Malayalam and seemed baffled by the sounds of English and Bengali. When he fussed, I automatically said “shh,” but this seemed to frighten rather than soothe him. Our ways of holding and rocking him were also very different from those of the caregivers. At times we felt discouraged because we loved him so much, yet we couldn’t communicate our feelings to him. The director assured us, however, that Partha had learned “the art of love” (he had received love from his caregivers and had returned that love) and that he will be able to respond to our love after he joins our family. One of the most powerful experiences we had in the orphanage was our observation of the “going-to-bed” routine. Every evening at 6:30 p.m., everyone would sit on the floor of the largest room. Babies were in the laps of the caregivers or lying on mats. Those caregivers who were Syrian Christians chanted prayers in the gradually darkening room. To us, the sound was like the ocean — harsh and rough, yet beautiful and lulling. The babies quieted down. Everyone — caregivers, infants, and we — felt a great sense of peace. Our six days in Kerala were crammed with experiences such as these. Everything occurred spontaneously, yet we could not have planned a better trip. Our trip brought home to us the truth that, indeed, Partha has a culture, a way of life. What is culture but the details of daily life — the tastes of home-made rice cereal and Indian-made formula. . . the sounds of Malayalam. . . the smells of Kerala-style cooking. . . being rocked in an angular manner. Besides owning these memories, Partha has given his heart to the caregivers in the orphanage. We know that we can provide him with the stability and love of a family (something he doesn’t have now), but our trip made us see that he will be leaving behind many beautiful things. This realization was humbling. We are fortunate to have seen the world from which our baby comes. And yes, it was difficult to leave Kerala without Partha, yet it somehow did not feel totally wrong. For a few more months, he will be soaking up the atmosphere of his birthplace before beginning his life with us in America. 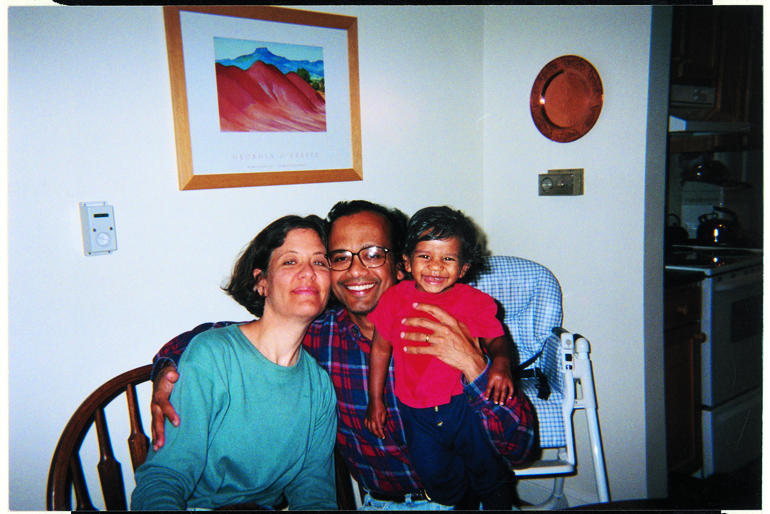 Postscript: Partha came home to us about four months after we visited him, when he was 10 months old. He has become an all-American boy — his favorite food is homemade chicken noodle soup. Everyone comments on what a happy child he is. Although we know challenges lie ahead, we feel blessed that Partha has a strong foundation of love.